A musician from City, University of London has been honoured with a prestigious title from the Orthodox Church. 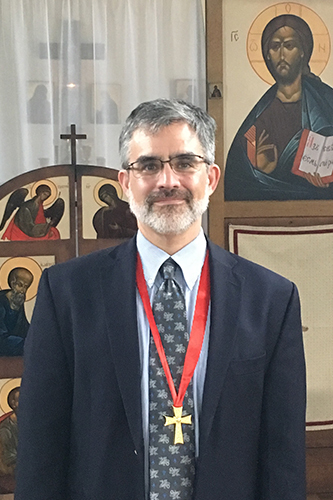 Dr Alexander Lingas, a Reader in the Department of Music, received the title of Archon Mousikodidaskalos of the Great Church of Christ. In ancient times, such titles were bestowed by the Emperor of the Byzantine Empire to officials of the imperial court. Now the honours are awarded by the leader of the Orthodox Church, Bartholomew I, Archbishop of Constantinople to clergy holding particular offices as well as others in society who have given exemplary service to the church. Dr Lingas, who is director of the world-renowned vocal ensemble Cappella Romana, said: “I am humbled to receive this title from His All-Holiness, Ecumenical Patriarch Bartholomew I. The title of Mousikodidaskalos (music teacher) was created in modern times primarily to honour individuals who have made exceptional contributions to the teaching and academic study of Byzantine chant. The City academic was awarded his new title at a service officiated by Archbishop Gregorios Theocharous, the leader of the Greek Orthodox Archdiocese of Thyateira and Great Britain. It took place at the chapel of the Archdiocese, at Thyateira House in London. In 1994, another City academic, Professor Costas Grammenos of Cass Business School, received the title of Archon. The Department of Music at City, in association with the School of Byzantine Music of the Greek Orthodox Archdiocese of Thyateira and The Hellenic Centre, recently presented an evening honouring the contributions of the late Archimandrite Ephrem Lash to the dissemination of Byzantine musical traditions in the English-speaking world. A panel of distinguished speakers including Metropolitan Kallistos of Diokleia and Father Andrew Louth was followed by Cappella Romana and the School of Byzantine Music presenting a selection of liturgical chants. This event was part of the 2018 City Summer Sounds festival.